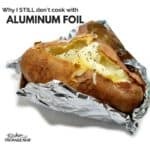 Want to avoid aluminum foil because of the negative health effects, budget savings or just to be kind to the earth? You don’t need it to bake potatoes. Wash and scrub potatoes as usual (scrub hard, especially if they’re not organic! They are often on the Dirty Dozen Produce list). Cut out any eyes or green spots (not good for you!). While the potatoes are still wet, sprinkle some coarse salt on the outside (Kosher works well). You can optionally grease them with a little olive oil, but it’s not necessary. Arrange on a cookie sheet (non-aluminum, or use a silicone mat or parchment paper underneath) or glass casserole dish. You can also put them right on the rack and save dishes. Bake as usual (350-400 degrees for 45-60 minutes, until they give when you squish them). Added bonus: The skins (almost completely) peel right off with this method, so you can easily make potato salad without having to bother with a veggie peeler.